Good jeans, bad jeans and everything in between..
What it really boils down to though, is the fact they’re a pain in the arse to buy. I know what I like, (skinny usually low rise, sometimes a little higher but nothing too high waisted), so you’d think it wouldn’t be such an arduous task.. However every time I find myself in need of new ones, the hunt for a semi-decent pair feels equivalent to some kind of Holy Grail style quest. The customised pieces are all handcrafted and one of a kind, so they’ll not be available to buy. Right now I have one pair in a UK size 10 to gift to one of you lot. The boyfriend cut is something that I’ve toyed around with for a while now. I understand why they’re flattering but I’ve never been a huge fan of anything too baggy. One of the reasons why I avoided the whole palazzo pants trend is a little like my feelings towards maxi dresses, I appreciate them on other people but for whatever reason they just don’t work on me. Boyfriend jeans went into the same category but lately my curiosity has been reignited by the skinny boyfriend jeans favoured by the ultra chic Blair of Atlantic Pacific. They’re flattering without being totally shapeless and making you look untidy and slimming without being so tight they cut off your circulation. I’ve got this pair from Warehouse in a size 10 to giveaway so if you’d like to get your hands on a pair…. Next Post Pasqualinos: possibly the best pizza in Newcastle.. I know what you're going through. 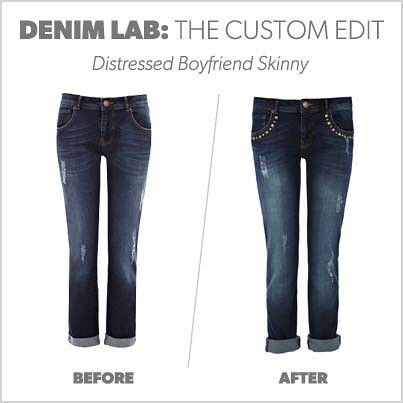 Although I have a couple of pairs in my wardrobe, I'm on the hunt for the holy grail of boyfriend jeans. I want them mid to pale, worn in but no rips. I have ripped ones already and I keep putting my foot through the knee rip which is a real pain in the backside. I've decided I don't suit the really baggy ones (I have a pair of moderately loose ones and I've conceded they're not flattering) and so today, I had a mini search for new boyfriend jeans. It was like Goldilocks and the three jeans – too tight, too ripped, too this too that. So I know what you're going through. However, unlike you, I live in jeans – they are just too easy for me around the kids. I'm not giving up my search though because that would be no fun!